I still can't believe its already March. It feels like we just did New Years Resolutions yesterday. I have realized the saying is true and life really does fly by the older you get. Ugh! Well next weekend is my birthday and I will be starting the last year of my 20s....how's that for making you start to question if you have accomplished everything you wanted to by 30? How much can you cram into a year?! That's something anyone could ramble about enough to probably write a book though, so ill just stick to more fun stuff. I've put together a birthday wish list! Key word is WISH for many of these things! Yes, some of these are repeats from previous gift guides, but I just think that shows they are things I really want! 1. Is really #1 on my list! I have been dying over this clutch ever since I first saw it!! Maybe the sale gods could make it 75% off just for one day! 2. This tee is just fun and makes me smile!...kind of fitting too! 3. I have realized I need to do a better job at taking care of my skin. I have always wanted to try La Mer, yet the price always holds me back in the fear that all the saying about it will be true and I will then be in love with a moisturizing cream that is absurdly priced! So have any of you tried it?! I would love to hear some of your thoughts if so! 4. Oh the H Bracelet, it has been on my list for a long time...and they just did a price increase...thumbs down. But that also means I need it before they do another one right!? 5. To receive flowers just like these! Btw do you follow Olivia P on Instagram?! If not go do it now! !...along with her now fiancé Johannes Huebl...their fashionably chic jet set life will make you want to be them when you grow up! 6. 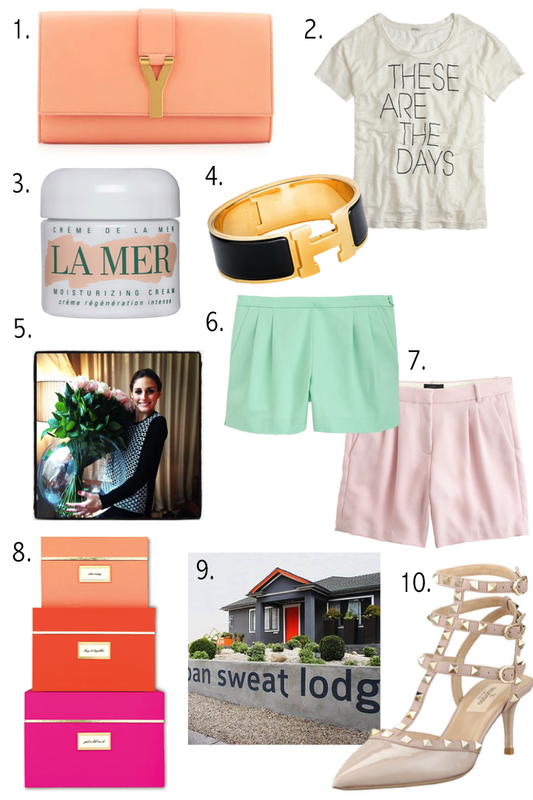 These mint shorts are so fun and feminine and area also my way of day dreaming about warmer weather. 7. Although the longer length blush shorts are super chic too. Does a longer length mean you're older or just wiser!? 8. These nesting boxes will be perfect in my closet makeover I'm working on....the colors are exactly what I'm obsessing with right now. Lets get real...I will most likely buy these for myself before my birthday even comes around! 9. A trip to the Shape House aka Urban Sweat Lodge! 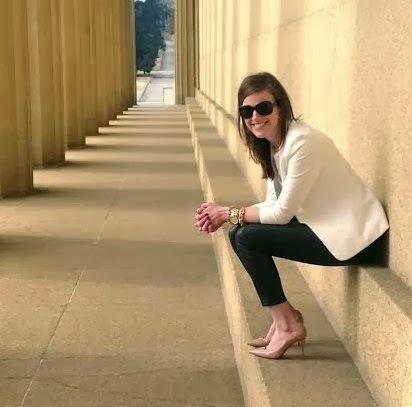 Ok, so I live on the wrong side of the country...but after seeing this place on several tv shows I so with we had one in Nashville as I would have been there yesterday! 10. The infamous Valentino Rockstud pumps...they are just so fun! Love your picks! My birthday is the 18th, so we're almost birthday buddies. I'm turning the big 3-0, so I have mixed feelings about it, but if I could get some pretty presents like these...maybe it will be okay! Lots of dreamy picks! I just spent way too much time on Olivia P's IG page though....depression!! I got a sample of La Mer eye cream at Blue Mercury and it is really good stuff. I too was dreaming of trying it and since you only need the tiniest amount my itty bitty tube has been lasting me. Hope you get a chance try it out!